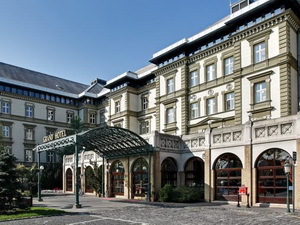 Győr hotels. Travel guide of Győr, Hungary. 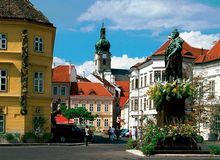 The industrial city of GYÖR (pronounced "Dyur") harbours a waterfront Belváros stuffed with Baroque mansions and churches, where streets bustle and restaurants vie for custom. 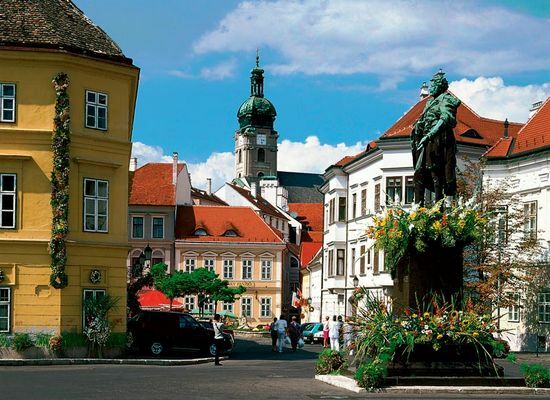 The city also makes an excellent base for excursions to Pannonhalma Monastery. 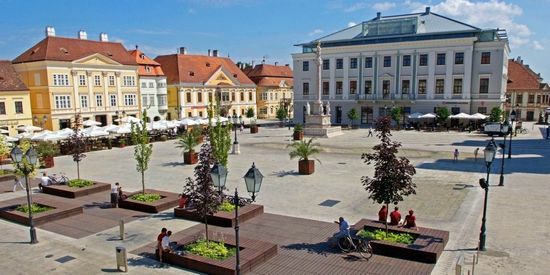 Gyor's history owes much to its location at the confluence of three rivers - the Rába, the Rábca and the Mosoni-Duna - in the centre of the Little Plain. The place was named Arrabona by the Romans, after a local Celtic tribe whom they subjugated, while its current name derives from gyürü, the Avar word for a circular fortress. 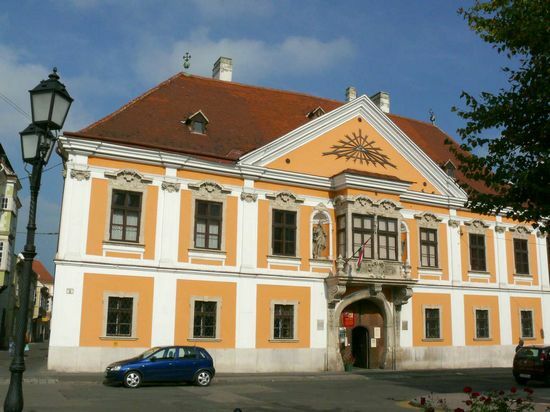 During the Turkish occupation of Hungary, its castle was a Habsburg stronghold and the town was known as Raab (after the Rába River). After its military role diminished, Györ gained industrial muscle and a different kind of clout. 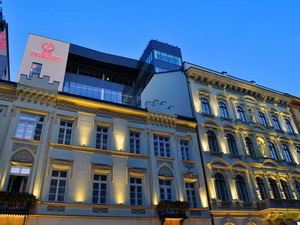 In the 1956 Uprising, its town hall was occupied by a radical Provisional National Council that pressed the government to get Soviet troops out and to quit the Warsaw Pact immediately. A web of streets and alleys stretching from Széchenyi tér to Káptalandomb, the old quarter is covered by preservation orders and traffic restrictions, making it a pleasure to wander around. Heading up pedestrianized Baross Gábor utca, antique side streets beckon on your left, narrow and shadowy with overhanging timbered houses - the perfect setting for a conspiracy. Indeed, Communists met secretly during the Horthy years at no. 15 on Sárlo köz, a cobbled alley forking off Kazinczy utca. Chances are your emerge on to Bécsi kapu tér, overlooking the River Rába, which reputedly escaped flooding in the eighteenth century thanks to a miracle working statue of Mary of the Foam, occupying a chapel beside the former Carmelite church. Entering through a portal whose inscription proclaims "I worked zealously for the Lord of Hosts", you’ll find a richly decorated high altar and other furnishings carved by Franz Richter, a lay brother in the order. 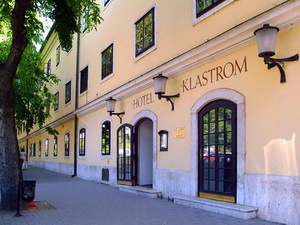 Behind the church stands the erstwhile monastery, subsequently used as a refugee centre and military prison and now converted into the Hotel Klastrom. 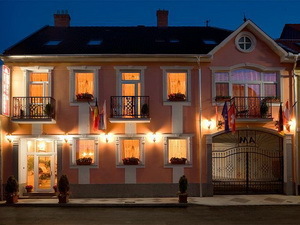 On the eastern side of the square are two mansions with finely wrought ironwork. 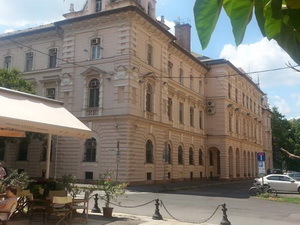 The Zichy Palace built in 1778-82, has a balconied Zopf-style facade bearing the coat of arms of the Ott family, who owned it at a later date. Next door stands the Altabek House (no. 12), with two comer one] windows dating back to the sixteenth century, and a Baroque portico. Just around the corner at Alkotmány utca 4 is the so-called Napoleon House where the emperor stayed during a visit in 1809, and which now contains a picture gallery of mostly nineteenth-century works. 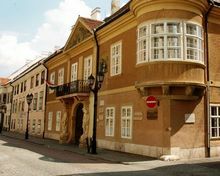 From Bécsi kapu tér you can carry on uphill past the surviving bastions of Györ's sixteenth-century Castle, where visitors can see a courtyard full of medieval stonework and underground casements. The castle successfully resisted the Turks for decades - unlike the town, which was frequently devastated. 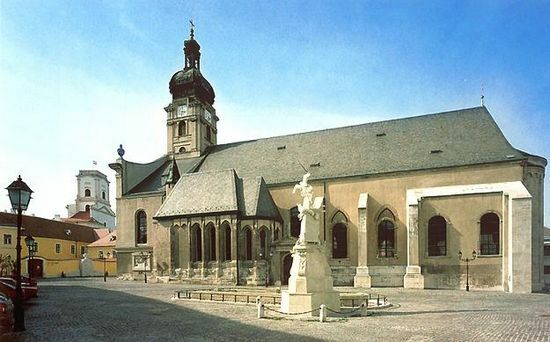 Káptalandomb (Chapter Hill) has been crowned by a Cathedral ever since King Stephen made Györ an Episcopal town in the eleventh century, so the existing building incorporates Romanesque, Gothic and Baroque features. Just inside the entrance, the Gothic Hederváry Chapel contains a reliquary bust of Saint László, the canonized monarch who ruled from 1077 to 1095. Sensitively moulded and richly enameled, it is a superb example of the goldsmith's art from the workshop of the Kolozsvári brothers. The frescoes inside the cathedral were painted by Maulbertsch, who decorated numerous Hungarian churches in the eighteenth century, while the Bishop's throne was a gift from Empress Maria Theresa. The building to the southeast of the cathedral houses the Miklós Borsos Collection of paintings and sculptures by the self-taught artist who designed the Kilometre Zero monument on Clark Adam tér in Budapest. 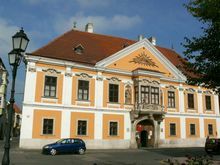 In the other direction lies the Bishop's Palace (Püspökvár), a much remodeled edifice whose oldest section dates from the thirteenth century. From here you can walk down Káptalandomb utca past the Zopf-style Provost House to reach the Ark of the Covenant, a splendid Baroque monument erected by Emperor Karl III by way of an apology for the Habsburg soldiers who knocked the monstrance from a priest's hands during a Corpus Christi procession in 1727. Just beyond lies Duna-kapu tér, a waterfront square alongside which Danube grain ships once moored, and where food markets are still held on Wednesdays and Saturdays. Notice the iron weathercock on top of the well, an allusion to the one that the Turks fixed above the town's gate, boasting that they would never leave Györ until it crowed. Should you want a change of scenery, cross the Mosoni-Duna River to the Révfalu district, where a fifteen-minute walk will bring you to the Bishop's Wood (Püspök-erdö, an attractive park with deer and other fauna. Alternatively, you can cross the Rába via a small island linked by bridge to Bécsi kapu tér and the Sziget district. At the northern tip of Sziget there's a swimming pool that's open during the summer and an outdoor thermal bath that's open year-round. Nearby at Kossuth utca 5 is a domed former Synagogue built in 1869 - worth a visit if you can get inside. 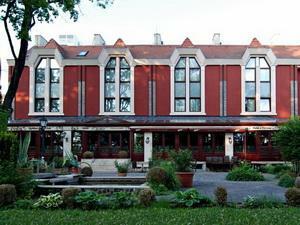 There's more to see, however, behind Duna-kapu tér, starting with the Margit Kovacs Collection at Apáca utca 1. This is just as delightful as the museum of her work in Szentendre , but closer to home, as Kovács (1902-77) was born in Györ. On the other side of the road, Bread Alley (Kenyér köz) and Soap Alley (Szappanos köz) lead to Széchenyi tér, traditionally the main square, overlooked by eye-like attic windows from the steep roofs of surrounding buildings. Notice the Iron Stump House on the northern side of the square, called after a wooden beam into which traveling journeymen hammered nails to mark their sojourn. 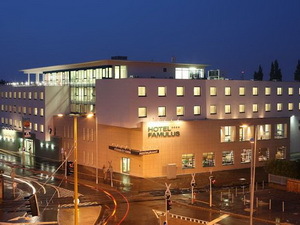 The building now contains the Imre Patkó Collection of paintings and African art, which deserves a visit. Next-door is the Xantus János Museum, named after a locally educated archeologist (1825-94) who emigrated to America and subsequently traveled in China. You can buy a leaflet in English describing the varied and fascinating artifacts relating to local history, while the collection of tiled stoves needs no explanation. Further east, take a look into the Tuscan Renaissance-style courtyard of the erstwhile Hospice at Rákóczi utca 6; a second courtyard at the back contains a fountain embellished with statues of birds. Back on Széchenyi tér, with its ornate Marian Column commemorating the recapture of Buda Castle from the Turks, the Benedictine Church of Saint Ignatius was designed by the Italian Baccio del Bianco in the 1630s. A painting in the sanctuary by the Viennese artist Troger (1794) depicts the saint's apotheosis. Beside the adjacent monastery is the Pharmacy Museum, a beautifully furnished seventeenth-century apothecary that still functions as a pharmacy. 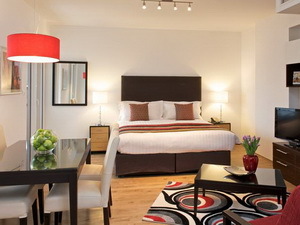 SEE GYÖR HOTELS ON THE MAP! 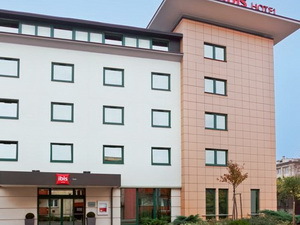 4-star hotel in Győr, 130 kms from Budapest. The Golden Ball Club is one of the most popular sport and wellness centres in Gyõr, situated only 200 meters from the very centre of the city, on the edge of the Eötvös park. 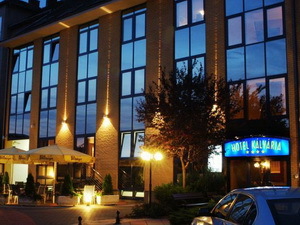 3-star hotel in Győr, 125 kms from Budapest. 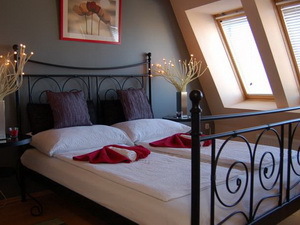 The 3-star Hotel Baross is situated 800 metres from the city centre Györ, along the main road no. 83 leading towards the town of Pápa. 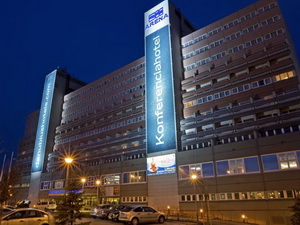 The hotel is one of the largest convention centre in Györ and surroundings with up-to-date technical equippment and large space. 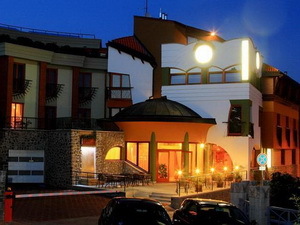 The conference rooms in the Hotel Famulus**** were developed according to the recent requirements. 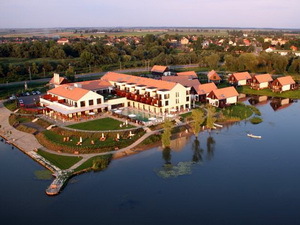 4-star hotel in Győr, 124 kms from Budapest. 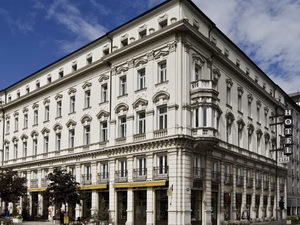 The four star Hotel Isabell is located at a five minutes distance from the historical downtown of Györ, 200 m far from the thermal bath, near the Wien-Budapest main road. 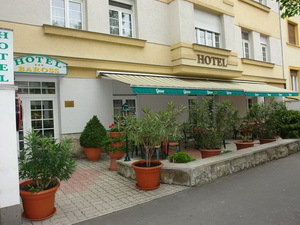 3-star hotel in Győr, 124 kms from Budapest. 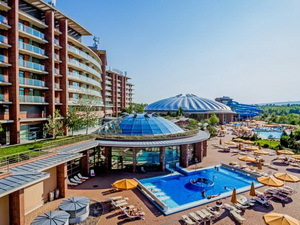 Aquaworld Resort Budapest, and Aquaworld Water-Empire next door, is most likely one of Budapest's most beloved tourist attractions. 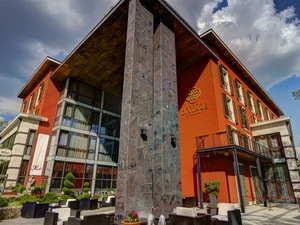 The complex offers comfort and relaxation, as well as opportunities for entertainment and active rest guests who are fond of wellness, fitness and fun. 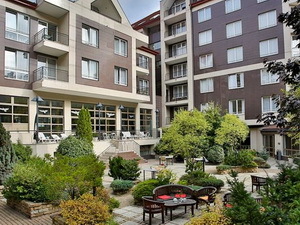 Adina Apartment Hotel - Adina Apartment Hotel makes one promise, you will enjoy the difference between staying in a hotel and the Adina Apartment Hotel. The difference is lifestyle - not just a room but your own private apartment, an office, a place to entertain and space for the family.